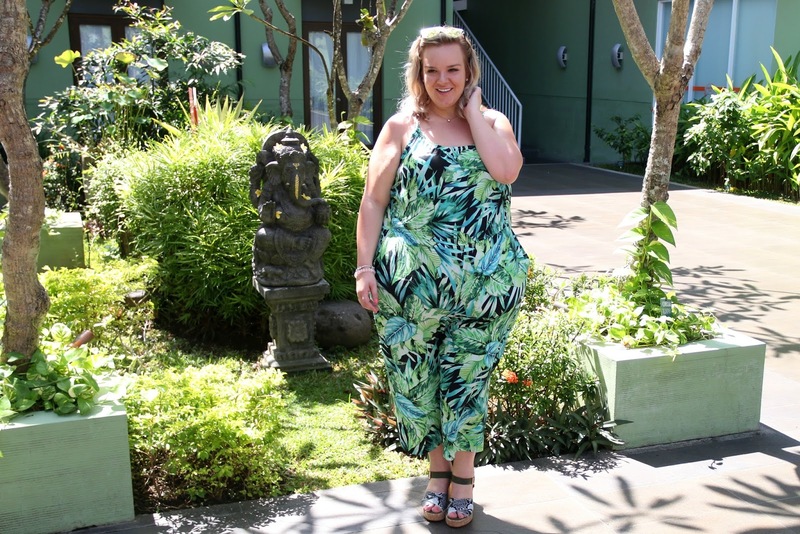 When in Bali, wear a tropical jumpsuit. Ladies, if you’re heading off to a sun soaked destination this summer, then make sure you pack a jumpsuit in your suitcase. This all-in-one style is perfect for summer holidays and weekend days out back home because it ensures you look fabulous with very minimal effort. When the sun is shining, that’s exactly what you want; simply, pull on and go. 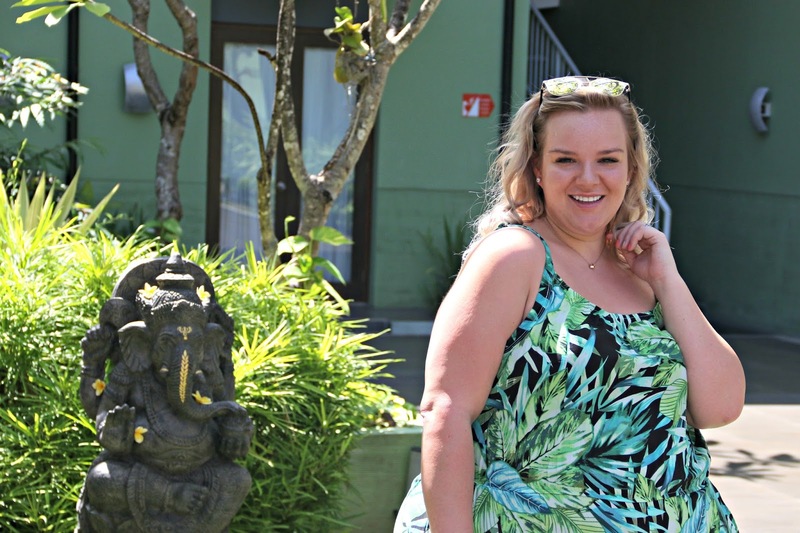 On holiday, I’m all about quick and easy looks and that’s why a jumpsuit is so essential. Add a pair of chunky heels or sandals that’ll match a multitude of different outfits, a pair of sunnies that’ll have you looking stylish whatever the weather, along with a fantastic SPF and some makeup essentials that can take you from day to night and you’re sorted. For me, that means a tinted moisturiser, my fave being the Origins Vitazing, a tinted lip balm such as the YSL Volupté Tint-in-Balm that I can’t get enough of right now and some false eyelashes which instantly make me look and feel more awake! False lashes can be as subtle or as bold as you like; on myself, I prefer ones that give a noticeable enhancement to my lashes while remaining natural looking. Ever since jumpsuits and the shorter version, playsuits, or rompers if you’re from across the pond, came back into fashion, I’ve been enjoying wearing them. Aside from how effortlessly stylish they can look, I have to admit that their main draw is how comfortable they are and how easy they are to wear. 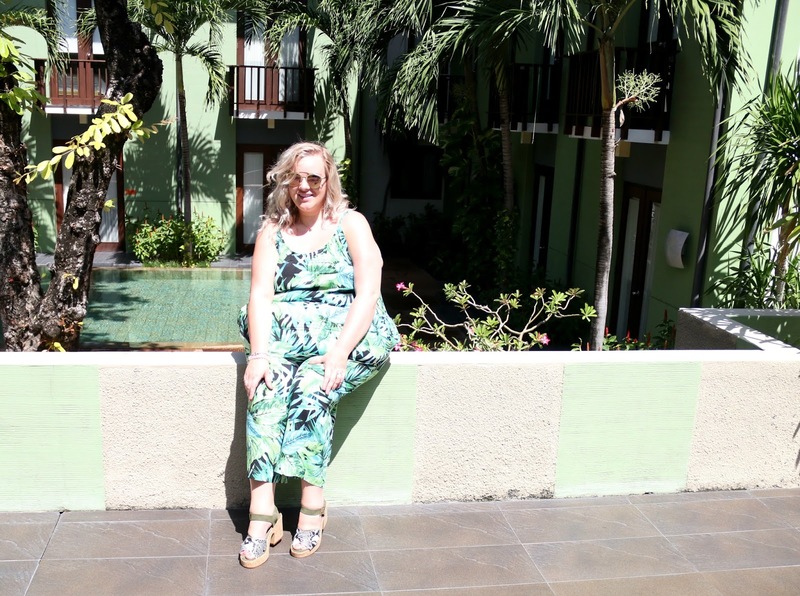 One of my current favourites is the Yours Clothing Tropical Palm Print Jumpsuit which is perfect for wearing out here in Bali thanks to its lightweight fabric. After all, I don’t want to be sweating anymore than necessary in such a hot climate! This makes breathable materials an essential to me, plus the thin composition ensures that they’ll fold up really small, giving me extra room in my suitcase. 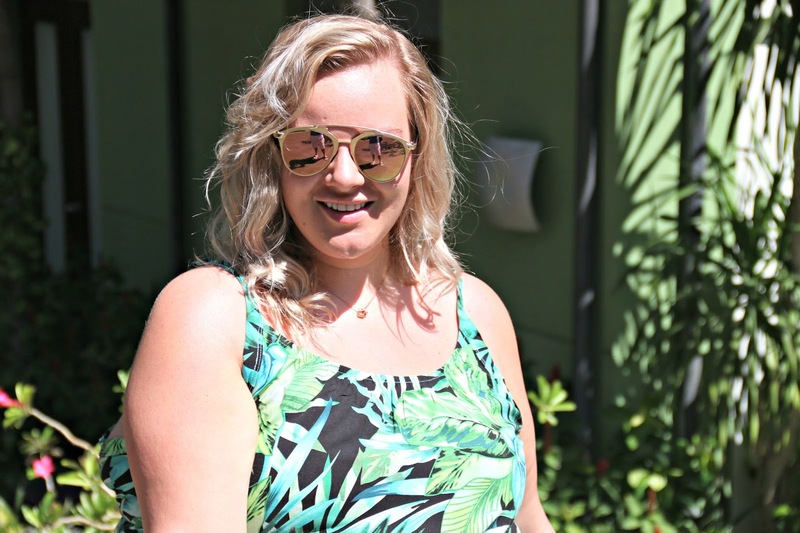 As with the vast majority of items that I find from Yours Clothing, the Tropical Palm Print Jumpsuit is true to size. 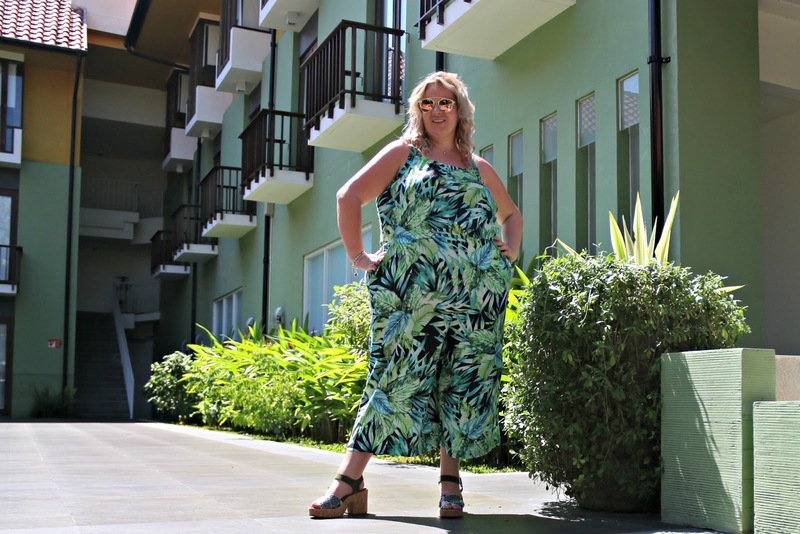 I got the size that I would usually get for trousers and found the jumpsuit to be a great fit and for all there is no stretch in the material, the relaxed fit ensures that there’s plenty of room for me to comfortably move about it in it. You’ll see the stylish shape from the photographs; wide, cropped legs cut into a culotte style. Uber flattering, easy to wear and perfect for styling with flats, heels or wedges. However what makes the cut of this jumpsuit so special is actually the very simple addition of the elasticated waist and neckline. Unfortunately, not all jumpsuits are made equal in this world and the cut and shape of some I’ve tried from other stores has been nothing short of comical. You wouldn’t believe the amount of jumpsuits with a round neck I’ve tried that are made of a stretchy jersey material with a more than generous body but then a completely rigid neckline (ASOS I’m looking at you) with no zip or button on the back of the neckline so they have no give in them whatsoever to help you get into them. With the best will in the world, a stomach as wide as mine is not going to fit through a hole designed for a neck without it busting the stitches! This makes me appreciate the fit of this particular Yours Clothing jumpsuit even more. Plus, it has pockets so whats not to love? The adjustable straps offer the ability to customise the size to fit you more precisely and since they’re not too thin, you could wear a normal bra underneath if you didn’t want to opt for a strapless style like I have. The straps give you the option of going bare on your arms which is particularly handy for hot climates or adding a cardigan or pashmina to cover your arms if you would feel more comfortable that way. This jumpsuit is very versatile as it can be dressed up with heels and a clutch for summer nights out or down with sandals and a cross body bag for during the day. Again, this is a space saver when it comes to packing for your summer holidays! Another option for switching up the look of this jumpsuit is by adding a top underneath. If you’re a follower of trends and loved the 90s then you might remember dungarees and dresses with skinny spaghetti straps worn over t shirts being all the rage. Taking inspiration from that look, I can envisage a close fitting, white t shirt or cropped top looking fabulous underneath this jumpsuit; the palm print would stand out even more! The print on this jumpsuit with its mix of greens and blue is so striking against the black backdrop and the mix of hues makes it easy to pair with any accessories and footwear from a similar colour palette. This makes it great for travelling because you’re not having to pack specific shoes that only match one outfit. 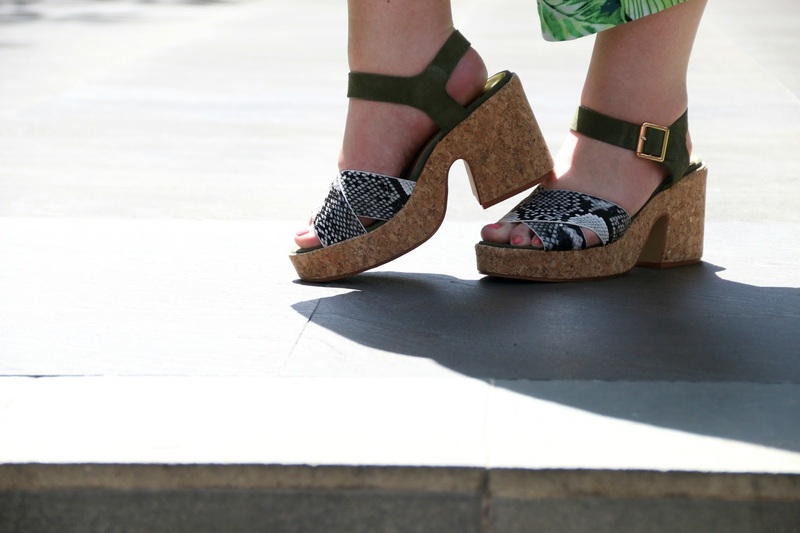 I paired it with my River Island Khaki Snake Strap Cork Block Heel Sandals to pick out the green within the print but it could easily be worn with greens or blues, black or even metallic silver or gold. These River Island heels are an absolute dream; aside from looking gorgeous, they fit securely on my feel without rubbing and I can walk, dance and stand for hours without them hurting my feet. Stilettos, and in fact the majority of heels, really hurt my feet to the point where I’ll just not even bother buying them, whereas the chunky block heel and the wide base make these so incredibly comfortable. I have them in the khaki with the snake print and I have bought them in the dusky pink too as I know that they’ll see me through many summer parties for years to come. Finding shoes that are so comfortable and fit so well is quite a rarity for me, especially for heels, so I like to snap them up in the colours that I love while I can! 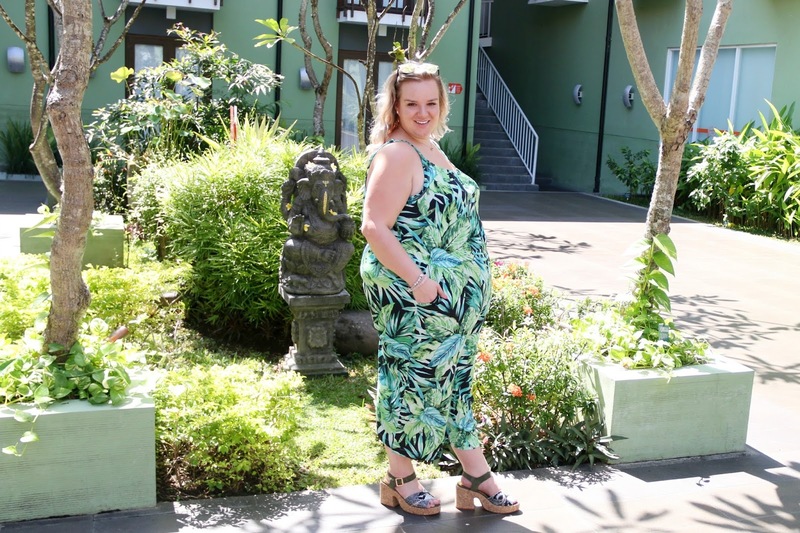 Whether you’re off on your holidays this summer or enjoying plenty of what our British summertime has to offer, I’d highly recommend adding a Yours Clothing Tropical Palm Print Jumpsuit to your wardrobe. 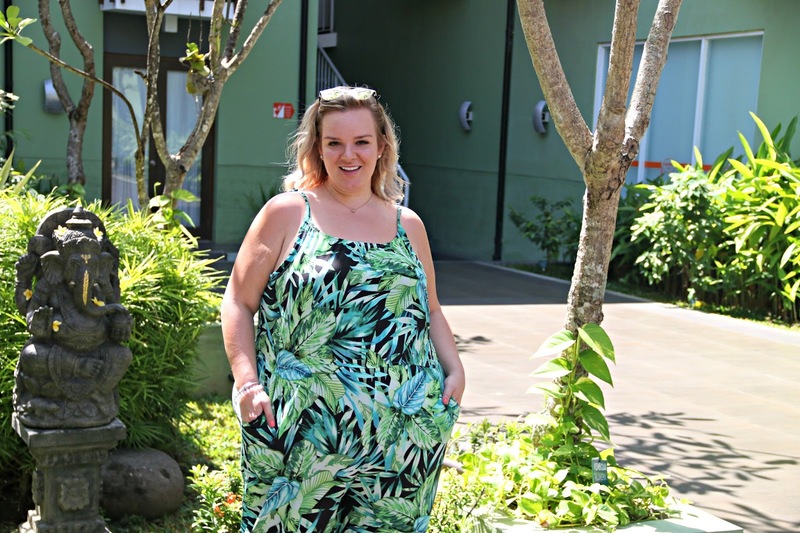 I’ve loved wearing mine so far in Bali and it was the outfit that I chose to wear on our first day here, leaving the Harris Tuban budget hotel that we stayed in after our late night flight and travelling to our first luxury accommodation, the Alassari Plantation. If you’re travelling to Bali and are looking for an affordable hotel near the airport, then I’d really suggest checking out the Harris Tuban which is part of the Harris chain of hotels. We booked through Booking.com and paid only £25 for the night which provided us with a really comfortable nights sleep. The room was spacious, clean, had tea and coffee making facilities, a safe and all of the amenities that we needed without opening our suitcases, such as a hairdryer, toothbrush and toothpaste, shampoo and shower gel. Breakfast the next day was around £4.60 extra each and definitely worth it for the delicious mix of traditional Indonesian and western cuisine, served as a buffet. The Nasi Goreng was a particular highlight. After breakfast, we had a few hours to wait until our driver arrived to take us to the Alassari plantation, which we used to enjoy the hotel’s facilities, namely the pool which was surrounded by the most comfortable sun loungers and rattan day beds. While the pool may have been small, it was perfectly formed and ideal for relaxing around after such a long flight; I even managed to get a little bit of work done on my iPad while lying out in the sun. This summer, I’ve really come to acknowledge the benefit that being in the outdoors when its warm and sunny has on my productivity and its definitely something that I’m going to consciously continue with when I get home. Creating an outdoor space with rattan garden furniture will be first on my list of things to do when I get back as the old wire dining set we have in our garden at the moment is not comfortable enough to sit at to do work, let alone to gather friends around for afternoon Pimms! For being so close to the airport, the Harris was a surprisingly quiet hotel and of a much higher standard than I expected. The great rooms, outdoor areas, cafe and bar are only overshadowed by the friendly, smiling staff. 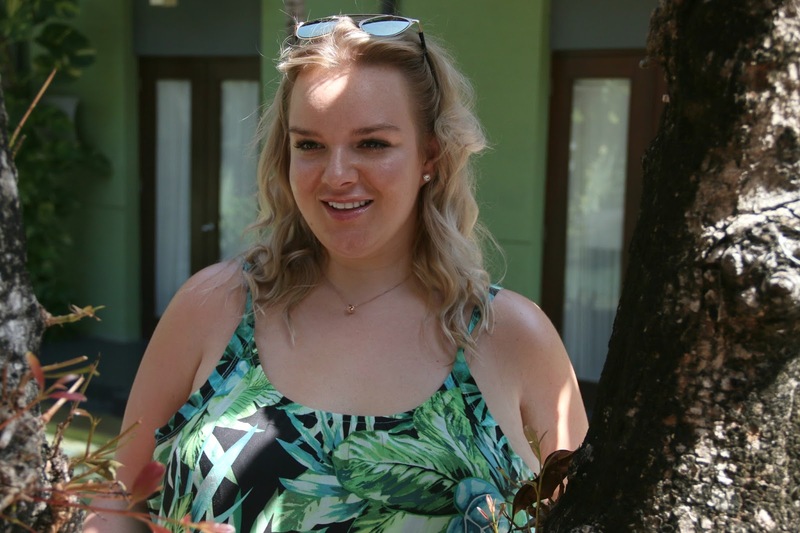 It is a hotel I’d recommend you check out when travelling in Bali! 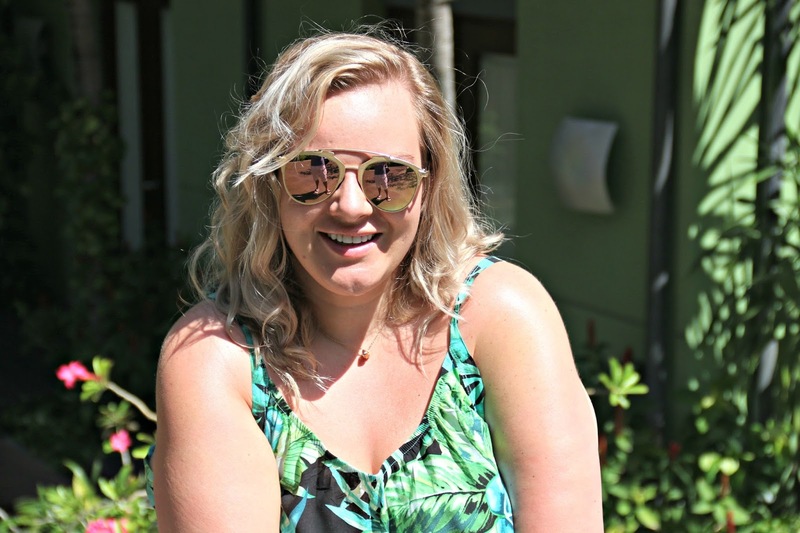 I’ll be sharing so much more from my trip over the coming weeks so do check back to see more hotel recommendations, tried and tested beauty and SPF products and plenty of outfits to inspire your holiday wardrobe! What are your summer wardrobe essentials? How do you style jumpsuits? Have you ever travelled to Bali and how did you find it? Next Post VICHY Idéalia Peeling: Perfect Overnight Peel for Sensitive Skin! You look incredible, I love that print. Would love to visit Bali! That is a beautiful jumpsuit and you look incredible in it. I'd never thought about buying a jumpsuit before but would do now. I love this outfit! The playsuit looks so comfy and is a perfect holiday print. The sandals are gorgeous too, I love the chunky heel on them. You look absolutely amazing and its a, beautiful jumpsuit. Perfect for the summer. What an amazing jumpsuit! You look incredible in it! You really looks amazing I love your outfit and it looks comfy love the perfect combination with your sandals.